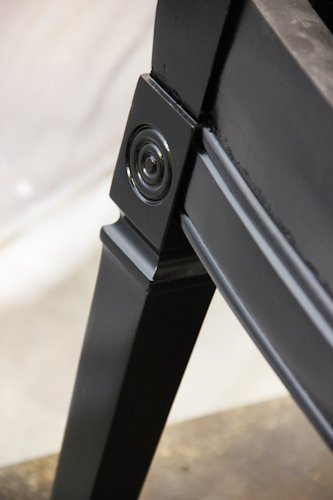 If you’ve read our bartop post, you know that Nate and I have a thing for black furniture. 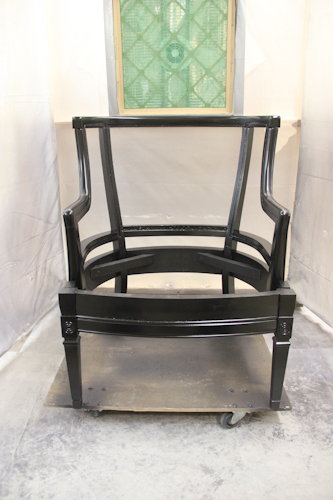 So it should come as no surprise that this chair would also be getting an “epic black” treatment. 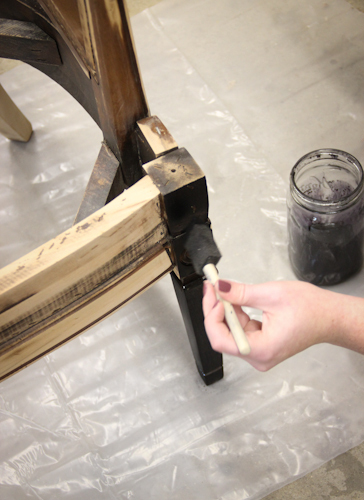 So far, we’ve tried just about every method we can think of to achieve that look – paint, stain, India ink, drawing ink, and dye. Dye is hands down our favorite. 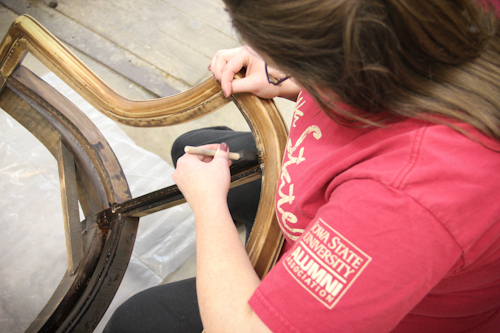 Unfortunately, completely sanding this chair down to bare wood so that I’d be able to wipe dye on every surface wasn’t going to happen (I didn’t feel like dousing it in solvents either). So we decided to experiment with a new technique – polyurethane mixed with black dye. 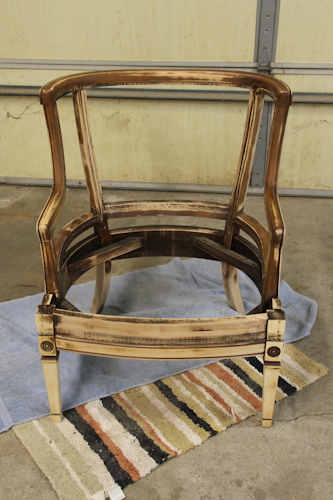 To start out, I brushed dye onto the entire chair and let it soak in wherever it could. The poly-dye mix would be sprayed on in thin coats. So I thought I’d try to save myself some effort by making the chair darker to begin with. 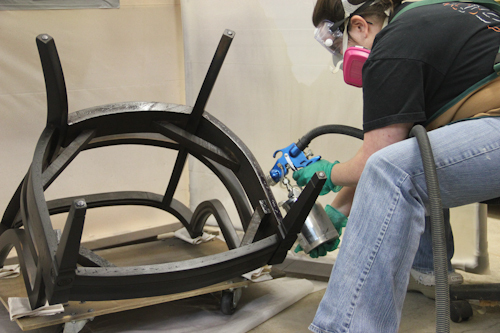 The following day, I put the darkened chair on a little base with wheels and rolled it over to our spray booth. 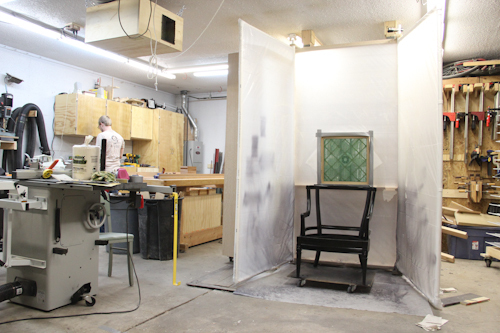 Maybe if you ask nicely, Nate will write about his awesome spray booth. Its definitely worthy of a post. With spray gun in hand (for the first time! ), I got to work. I sanded between each coat to remove any texture from overspray. Since this was my first spraying project, I tended to get a lot of overspray because I was a little timid with the trigger. Had I been spraying too heavily though, I would have drips and sags in the finish that would have taken a lot more work to sand out. 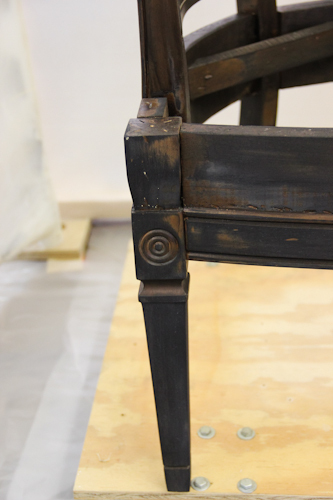 Finding the perfect balance between applying too much and too little finish takes some practice. After a good 5+ coats of dyed poly, I was happy with the color and was ready to seal it in with clear poly. I actually lost count of how many clear coats I sprayed on because each coat I kept thinking to myself, “Yay! This should be the last one!” After it was dry, I’d feel the overspray texture and decide to sand it and spray again. Sand, spray, repeat. Eventually, I decided to “let” Nate do the final coat. 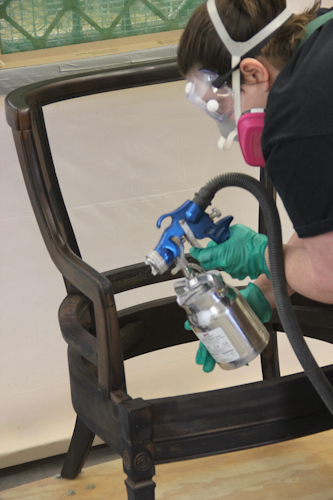 He has more practice with the spray gun and is therefore better at applying just the right amount of finish. Look at how beautifully it turned out! This picture was taken from the spot where my chair was sitting in the first picture. I thought you might enjoy seeing the spray booth in context with the rest of the garage. Nate is busily working on the second bookcase. Unfortunately, its hiding behind the left “wing” of the booth. You can see more photos of it in this picasa album. 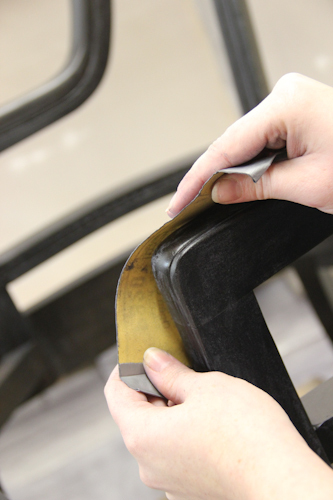 You can see more photos of my chair in progress in this album. Whew! Its amazing how much simpler the process seems when you write about it later. 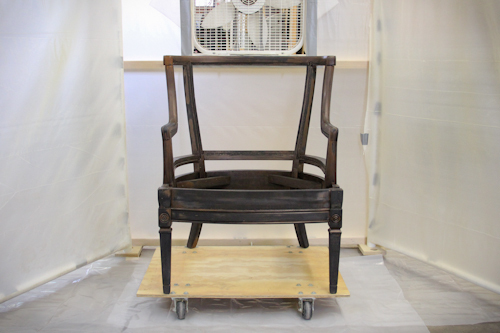 In hindsight, this particular chair might have been a poor choice not only for my first upholstery project, but also my first spray finish project. 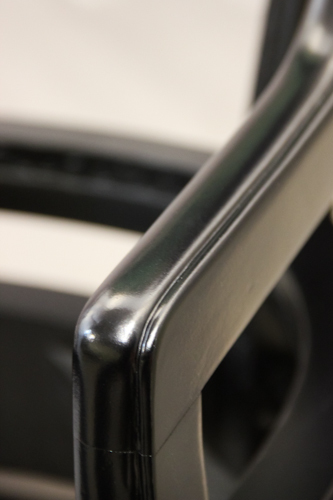 There are so many surfaces and angles that its tough to remember what you’ve sprayed already and what you haven’t yet. Luckily, things have been going great so far and I’m really proud of how its turning out. I’ve got my fingers crossed that I’ll be just as happy with the upholstery results. Feel free to leave upholstery tips if you have any! I’d love to read them.